RESEARCH TRIANGLE PARK, NC – January 3, 2011: Lenovo (HKSE: 992) (ADR: LNVGY) today announced its latest entry ultraportable, the ThinkPad X120e laptop, that raises the bar for affordable business-class performance. As the first commercial laptop to feature an AMD Fusion E-Series Accelerated Processing Unit (APU), the X120e blends real-world needs for faster applications and graphics processing with enhanced battery life and digital display features starting at less than $400. "Multimedia elements like audio and video have become important parts of our world, and businesses are embracing this trend in digital content," said Dilip Bhatia, vice president, ThinkPad Marketing and Product Operations, Lenovo. "We've optimized the ThinkPad X120e to not only give businesses an excellent experience creating and consuming multimedia content, but we've also made key improvements to an area that has plagued laptops: battery life." Professional Performance: The ultraportable X120e looks small, but it now packs an even more powerful punch for business productivity. Integrating an AMD Fusion E-Series APU gives users 65 percent faster graphics performance1, which speeds up Web searches, page loads and running business applications. At the same time, the X120e gives users longer battery life – up to 30 percent longer – for more than six hours2 and meets Energy Star 5.0 specifications. It also carries the EPEAT Gold rating for its environmental attributes. Additionally, the X120e comes with an HDMI port for projecting content on another monitor or a TV screen. "Mobile users no longer have to trade battery life for great graphics performance," said Chris Cloran,corporate vice president and general manager, Client Division AMP Products Group, AMD. "AMD Fusion APUs allow for thinner, cool-running devices that can last the day and do what's demanded of today's professional." Just-Right Fit: As compact as it is, the X120e is designed to fit just right for business users who need to balance portability and usability. An 11.6 inch screen and a full-size keyboard give users plenty of room to work comfortably, and the contemporary ThinkPad keyboard features a progressively clean look while retaining the same feel of the ThinkPad classic keyboard. Incredibly Mobile: Starting under three pounds3, the X120e includes WiFi and optional Bluetooth and mobile broadband. Watch a video of the X120e here. Lenovo offers a portfolio of service and support offerings to protect the X120e and to support IT departments. ThinkPad Protection covers repairs resulting from accidents, drops and spills, while ThinkPlus Priority Support provides 24x7 business-class technical support for IT administrators. 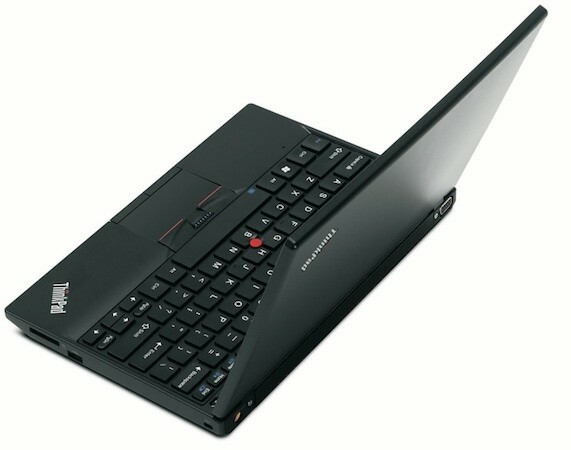 The ThinkPad X120e laptop will be available beginning in February through Lenovo business partners and www.lenovo.com. Models start under $400. satisfaction as well as a focus on investment in emerging markets. Formed by Lenovo Group's acquisition of the former IBM Personal Computing Division, the company develops, manufactures and markets reliable, high-quality, secure and easy-to-use technology products and services worldwide. Lenovo has major research centers in Yamato, Japan; Beijing, Shanghai and Shenzhen, China; and Raleigh, North Carolina. For more information see www.lenovo.com.